Microaggressions are brief, everyday exchanges that send denigrating messages to certain individuals because of their group membership (e.g., race, gender, culture, religion, social class, sexual orientation, etc.). These daily, common manifestations of aggression leave many people feeling vulnerable, targeted, angry, and afraid. How has this become such a pervasive part of our social and political rhetoric, and what is the psychology behind it? 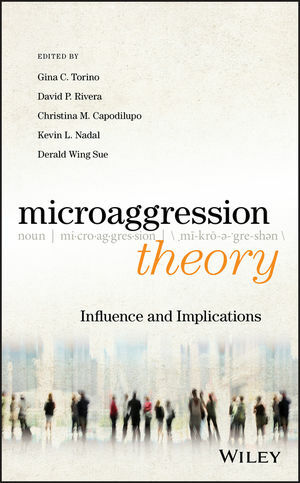 In Microaggression Theory, the original research team that created the microaggressions taxonomy, Gina Torino, David Rivera, Christina Capodilupo, Kevin Nadal, and Derald Wing Sue, address these issues head-on in a fascinating work that explores the newest findings of microaggressions in their sociopolitical context. It delves into how the often invisible nature of this phenomenon prevents perpetrators from realizing and confronting their own complicity in creating psychological dilemmas for marginalized groups, and discusses how prejudice, privilege, safe spaces, and cultural appropriation have become themes in our contentious social and political discourse. If you come across the topic of microaggressions in your day-to-day life, you can keep the conversation going in a productive manner—with research to back it up!